Most of the content you’ll find on the internet on how to find a real estate agent in NYC revolves around either traditional real estate brokerage firms’ agent rosters or fluff pieces on asking your friends for recommendations. None of these articles provide any actual advice or even hint at the possibility that home buyers can save money on their purchase through a buyer commission rebate or eliminate up to all 6% of traditional broker fees when selling through an Agent Assisted FSBO. 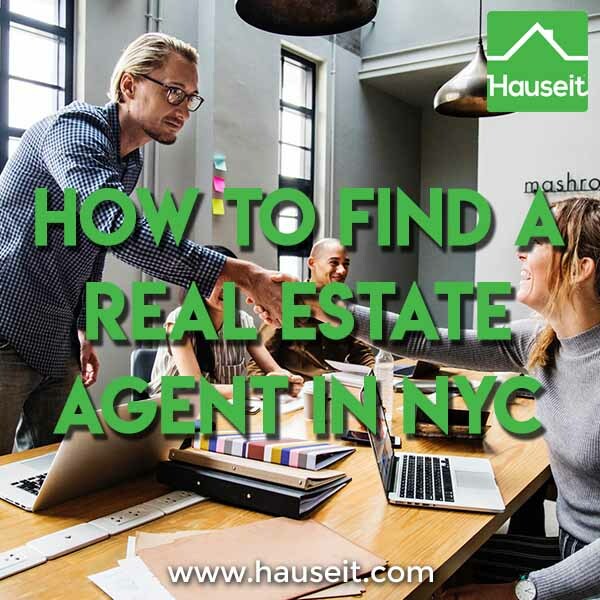 We’ll break down the most common methods you’ll find on the internet on how to find a real estate agent in NYC and give you some insider tips that brokers won’t want you to find out. This is the laziest way to find a real estate agent in NYC. Buyers and sellers who don’t bother doing any research on the internet on alternatives and simply agree to work with their neighbor as their broker typically do so because they believe that real estate commissions are not negotiable. As a seller, they’ve probably heard many times that paying 6% commission to sell in NYC is some sort of law. As much as real estate brokers would love for you to believe that, it’s certainly not the case. As a buyer, they’ve probably often heard that having a buyer’s agent is free, so what does it matter who you decide to work with? Why not your neighbor if it’s free? Unfortunately, there are over 50,000 licensed real estate agents in New York City spreading these common real estate agent lies to their neighbors. As a result, there will certainly be a good number of buyers and sellers who take the easiest route by connecting with their neighbor who is a real estate broker. New Yorkers receive several completely useless postcards from various real estate brokers every week. Most of these postcards will be completely inane with flattering profile photos of the agent and random quotes about how they know your neighborhood. The ones who have actually done deals will try to up their game by sending out postcards touting their latest sale. How annoying is that? Couldn’t they have saved a few trees by just letting people look online for the latest sales in their building if they were curious? Worse still are the postcards offering a complimentary home pricing and evaluation for home owners. Unfortunately, this is usually just a way to provide more detailed contact information to a local agent. We’ve seen home evaluations consisting of the agent stopping by the owner’s home, taking a look for a minute, and saying that it’s worth $2 million without any sort of backup or rationale. What a joke! The way most New Yorkers find a real estate agent is through their social network. Most real estate brokers prospect for clients primarily by networking and going to parties or events. As a result, you’re bound to know at least 5 friends or acquaintances who are real estate agents. However, simply picking a real estate agent from your social network assumes that there is no price differentiation in the market. As much as real estate agents would like you to believe that is the case, there’s simply too much money on the table for a savvy home buyer or seller to not try to negotiate the commission. You also run the risk of turning a personal friendship into a business relationship that could turn sour. The home buying and selling process can be extremely taxing and emotional, do you really want to bring that into your friendship? Furthermore, do you really want to share your REBNY Financial Statement, biography and detailed bank account statements with someone in your social network? Wouldn’t it be awkward for someone at a party to know every detail about your personal and financial life because they guided you through a co-op board package? A common way to find a real estate agent in NYC is to ask your friends and family for recommendations. However, this tried and true method only works so well assuming that there is no price differentiation in the market. Furthermore, your friends and family are not real estate experts, so the most you’ll be getting from a recommendation is the point of view of one person who’s not even a practicing professional. Furthermore, you run the risk of friends or family members pushing inexperienced or just plain bad real estate agents on you because of their personal connection with that agent. For example, your aunt might really push you to work with your cousin Donnie even though he hasn’t done a deal yet. She’ll say, Donnie is a natural salesman, he just needs to get his feet wet. Do you owe the most important transaction of your life to Donnie so he can get his feet wet? One way that home buyers and sellers frequently find a real estate agent in NYC is to look online for brokers who have completed a lot of transactions in their building or neighborhood. Often times, a broker who has done a lot of deals in a building may also live in the building. When this resident broker is also on the condo or co-op board, they may become so arrogant as to expect that everyone in the building will sell using their services. Contrary to what these so called local experts will want you to believe, real estate transactions are not complex enough where it matters what the broker knows about a particular building. This is especially true in the New York property market where lawyers take over once brokers have produced an accepted offer. All of the contract negotiation and due diligence is then taken care of by real estate attorneys. Even if you are selling a coop where the process is more complex, having a resident real estate broker who really knows your building is really irrelevant. That’s because any competent agent will be able to quickly learn about the building and neighborhood from a conversation with the seller. If the coop board has any peculiarities around the coop board application, any listing agent can quickly pick this up from a brief conversation with the seller. Incredibly enough, many articles on the web about how to find a real estate agent actually suggest working with an authoritative local expert if you need a “daddy figure” in your life. How insulting is that! Should you pay 6% in commission to someone just because you didn’t have a full time father growing up? Because the closing costs for selling an apartment in NYC are so high, it’s extremely important to consider lower cost commission alternatives before you sign an Exclusive Right to Sell Listing Agreement with someone pretending to be a building expert. As tempting as it may be for first time home buyers to find a real estate agent in NYC who will smother them with attention day and night, it’s often a poor idea because an agent who has that much time on their hands probably doesn’t do many deals. Furthermore, a real estate agent with no self-respect who will take a needy client’s calls late at night probably won’t be able to demand any attention from other brokers. We recommend working with a seasoned real estate broker in charge of a team of agents if you’d like more personal attention. This way, someone on the team will always be able to speak with you, and you’ll still get the advice of an experienced real estate broker with lots of deal experience. Remember that the top 10% of real estate brokers do over 90% of all deals in New York City. All the attention in the world won’t matter if your newbie real estate agent has no idea how the closing process works or how to negotiate on your behalf. You’ll want to work with someone who’s actually done a deal or two before!